"In Reykjavik, Iceland… it's billed as the chess match of the century. American Bobby Fischer pitches genius against champion Boris Spassky of the Soviet Union… combining seven victories with 11 draws, Fischer is the new World Champion when Spassky retires during their 21st game. Fischer becomes the first American to win the title… on September 1st, 1972." The pending rematch hopes to reinvigorate the chess world after the tragic cancellation of the Kasparov-Ponomariov match. ESPN will broadcast 17½ hours of the match beginning November 11th. ESPN will need as much publicity as possible as GM Maurice Ashley, the world's most accomplished chess announcer will not be in the booth to give his classic commentary. ESPN and Ashley were unable to come to agreement on contract terms. The network will field ESPN sports anchor Jeremy Schapp, and writer Paul Hoffman alongside GM Yasser Seirawan. With the absence of GM Ashley, ESPN spoils an opportunity to put the best face forward for the marketing of chess. GM Ashley does a number of things that cannot be easily replaced: first, he adds credibility as a Grand Master; second, Ashley and Seirawan have good chemistry and work well together; third, he brings a level of excitement to chess that is unparalleled; fourth, he provides chess with a broader appeal; fifth, he is clearly one of the most popular players in American chess; sixth, he has a down-to-earth style and uses common analogies; seventh, Ashley is simply the best chess commentator in the business. Let's hope sponsors are not turned off by 17½ hours of insipid commentary… at this point, the chess world does not need any more ridicule than what it has created for itself. 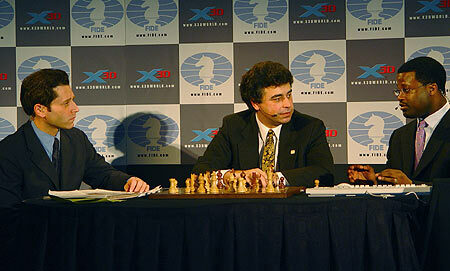 X3D Broadcast Booth: Jeremy Schapp, GM Yasser Seirawan and GM Maurice Ashley. Photo courtesy of ChessBase.com. The Chess Drum, "GM Ashley will make the call at X3D," 9 November 2003. The Chess Drum, "GM Ashley speaks on Kasparov-Deep Junior match!"